Looking to find those elusive Ocean State ancestors? �Rhode Island is a small state, but good record keeping and plenty of resources from the colonial period on means there are plenty of chances to locate your ancestors. 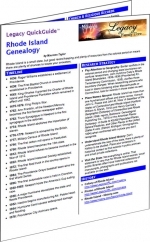 The Rhode Island Genealogy Legacy QuickGuide™ contains useful information including a timeline of Rhode Island history events, tips on Rhode Island research strategy, outline of major immigrant groups, and more. Also included are links to websites and resources covering vital records, church records, census records, as well as general Rhode Island resources.